DESCRIPTION: ASI 335 General Purpose Sealant is a Neutral Cure Oxime Silicone Sealant has superior adhesion to difficult surfaces like glass, vinyl, chrome, stainless steel, porous surfaces and most plastics. 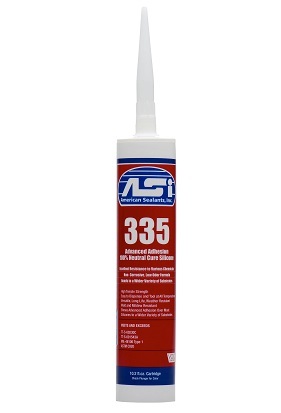 ASI 335 Neutral Cure Silicone Sealant/Adhesive is a one-part, non-slump, moisture-curing RTV (room temperature vulcanizing) that cures to form a tough, high modulus rubber with long-term flexibility and durability. The neutral curing mechanism of ASI 335 is ideally suited for use in confined work areas since no objectionable odors are evolved. The non-slump characteristics of ASI 335 allow application to vertical or horizontal joints without flowing or sagging. ASI 335 has excellent resistance to weathering including ozone, ultraviolet radiation, freeze-thaw conditions and airborne chemicals. After cure, the wide heat stability range of ASI 335 is from -57°C to +204°C (-70°F to 400°F) and the sealant can be applied to surface temperatures from -18°C to +50°C (0°F to +120°F). TYPICAL USES: Good unprimed adhesion to a many types of substrates is achieved with the use of ASI 335. For example, ASI 335 neutral cure silicone adheres to unprimed chrome and stainless steel and glass where other high modulus silicone sealants would require to be primed. As a formed-in-place gasket, ASI 335 exhibits low swell, low compression set and good oil resistance. These characteristics impart an unusual balance of properties to ASI 335 to prevent leakage in harsh environments such as engines, transmissions, water pumps, rear axles and oil pans. LIMITATIONS: ASI 335 is NOT recommended to be used in cylinder heads, exhaust manifolds or in contact with fuels. Limitations: Not paintable; Not for continuous submersion; Not recommended for use with fuels or exhaust manifolds. Metals: Aluminum Chrome, Steel, Stainless, etc. STANDARDS: ASI 335 Window Sealant meets the requirements of MIL-A-46146A, Type 1.